Subwoofers provide much needed bass to your car audio system. 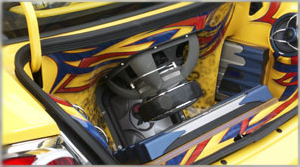 A subwoofer, enclosure, and amplifier are normally the first items purchased when building a car audio system. This is because adding a subwoofer to your system will give you the most bang for your buck in terms of upgrading your system. Listening to a song without a subwoofer makes you miss out on a third of the song since you miss all of the important lower frequencies. Since most cars do not include a sub, most people are missing out on bass frequencies when listening to their music.